The U.S. will deploy a Terminal High Altitude Area Defense interceptor to Romania this summer, a first for the European continent since Russia's encroachment into Eastern Europe and its annexation of Crimea in 2014. 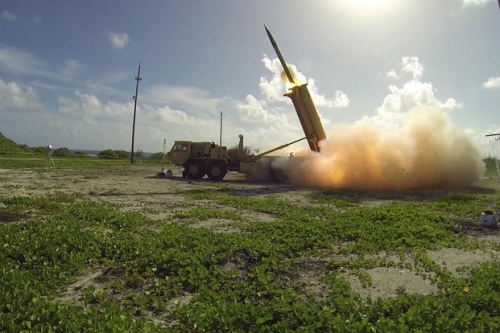 The THAAD, from the 69th Air Defense Artillery Brigade, 32nd Army Air and Missile Defense Command stationed at Fort Hood, Texas, will integrate into the existing NATO Ballistic Missile Defense (BMD) system, U.S. European Command announced. The THAAD system will be in place while NATO's Aegis Ashore Ballistic Missile Defense site in Romania -- which provides a defensive capability to NATO and its allies -- will undergo pre-planned maintenance and upgrades, officials said. The THAAD system will only deploy to Romania and will be controlled by NATO's Allied Air Command, officials said. EUCOM officials have pushed for the THAAD system for years to bolster air and missile defense in the region. The Pacific and Middle East already have THAAD systems. In 2013, the U.S. deployed a THAAD Battery to Guam in response to North Korea's third nuclear test, according to the non-profit organization Missile Defense Advocacy Alliance. In response to the growing North Korean threat, the U.S. announced in 2016 it was deploying THAAD to South Korea. The Army in 2017 deployed two THAAD truck-mounted launchers at Seongju, about 186 miles south of Seoul. More recently, THAAD was deployed to Israel for the first time in March. Under the Pentagon's direction, EUCOM deployed the missile battery to Israel to show "that U.S. forces are agile, and can respond quickly and unpredictably to any threat, anywhere, at any time," EUCOM said last month. The only other country that operates THAAD is the United Arab Emirates, which purchased the system from its manufacturer, Lockheed Martin Corp., in 2012. In 2017, U.S. State Department cleared a potential $15 billion sale of THAAD to Saudi Arabia.